This portable container was used to carry and grate nutmeg. An expensive and fragrant spice, nutmeg is the commercial name of the seed kernel of an evergreen tree, Myristica fragrans. It was imported into England from the East Indies, especially from islands that now form part of Indonesia. Initially nutmeg was believed to offer protection against the plague, but by the mid 17th century it was more commonly used to flavour food and drink. It was an important ingredient of punch and hot mulled wine. 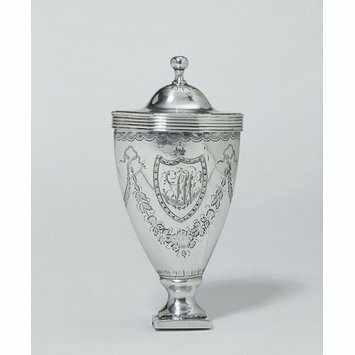 Nutmeg graters first appeared in the mid 17th century, with greater refinement in dining and a wider ownership of silver for the table. They were either carried in the pocket or included in a travelling canteen that might also contain cutlery, a beaker and a corkscrew. The graters reached the height of their popularity in the next century. Cheaper, thinner gauge silver, new manufacturing techniques and greater prosperity led to an enormous growth in items of small personal silver. 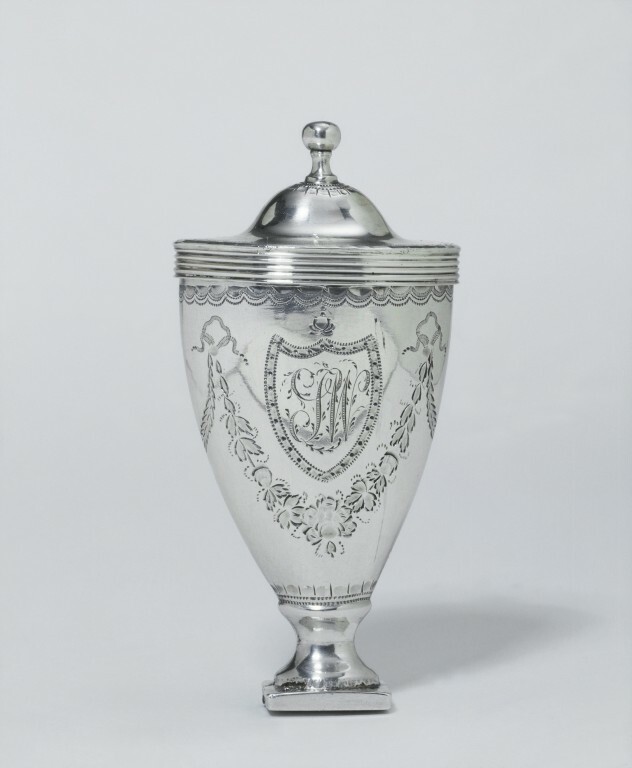 Nutmeg graters were then made in a variety of forms, from cylindrical, circular or oval boxes to more unusual designs such as hearts or shells, to express the owner's taste and individuality. The vase shape of this grater reflects the fashionable Neo-classical style of the later 18th century. inside body: maker, duty, sterling, date letter O (1809-10), leopard~Monogram on front in shield: SW or IW"